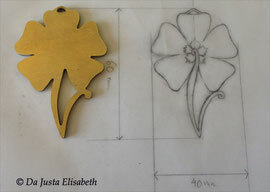 The drawing finalised, I then send the project to a professional to cut the contour of the full clover by laser. 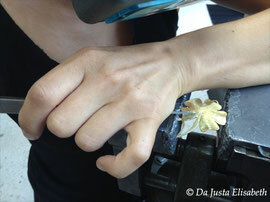 The pendant is made of brass with a thickness of 3mm. 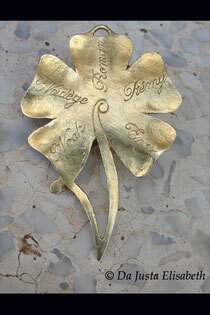 The last step in the creation will be to engrave each loved one’s first name on the back of each leaf. 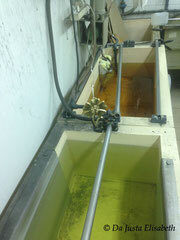 The pendant is now ready to be immersed in orther to cover the pendant in silver through electrolysis . Using a small hammer and a burin I engrave the inside lines of the clover and the “V” representing the first letter on Viviane’s name. 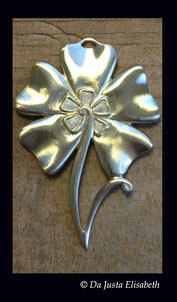 The pendant is now ready to be chiseled. 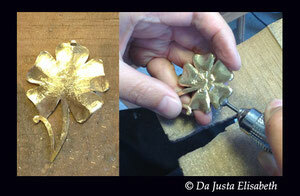 The front and back of the pendant’s volume as well as each element on the leaves come to life. The rough edges left by the process will be polished with small, sharp files and emery papers. 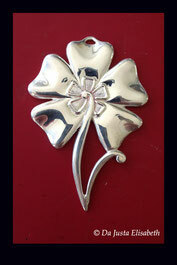 To conclude the centre piece of the clover will painted with red resin. 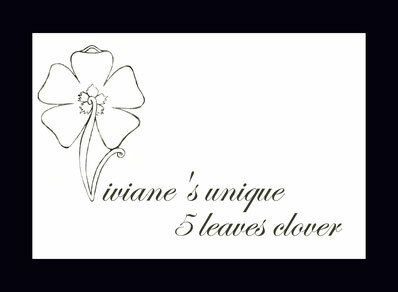 End of creation of the Viviane’s unique 5 leaf clover. A big thank you to Remy Struzik for our exchange of ideas that helped to magnify the project.